A historic Birmingham pub, just yards from Villa Park, is set to reopen for the bank holiday weekend after a major refurbishment. 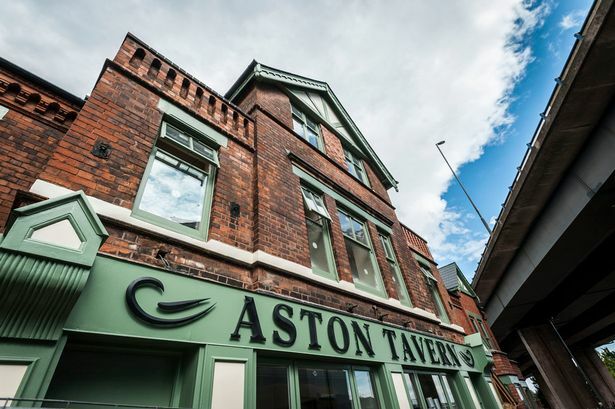 The 1904-built Grade II listed Aston Tavern has been restored and will open on August 23, to coincide with Aston Villa&apos;s first home match of the new football season. It has been derelict for more than 20 years and has been restored under a joint venture between the Homes and Communities Agency (HCA) and the pub&apos;s new owner and operator Chelle Property - run by entrepreneur Michelle Monaghan. Chelle Property had been sold the Aston Tavern in exchange for its existing pub the King Edward on Lichfield Road which is set to be demolished to make way for a new industrial estate - the Aston Advanced Manufacturing Hub. The historic pub, in Aston Hall Road, has been fully restored and extended to create a restaurant, pub and bed and breakfast. As well as catering for Villa fans on match days, it is hoping to serve visitors to Aston Hall and the business community and workers from the new industrial estate. Ms Monaghan said: "We are pleased to be at the forefront of an exciting regeneration project such as this. "This has been a demanding project, with emphasis on restoring this historic asset, which has been in a state of decline for some time. "We have been able to rescue features of architectural interest from the nearby King Edward, a building locally listed, soon to be demolished, keeping some local history alive. "We have extended the public house, allowing us to cater for today&apos;s changing markets, the local community and visitors to local attractions such as Aston Hall, the Villa ground and the beautiful Grade II-listed Aston Hall Church next door. "We hope everyone will visit to see what we have to offer to support this venture which we believe will have a positive impact on the local area." The pub&apos;s opening means that work on the Advanced Manufacturing Hub, an official regional investment site, can get under way. It is proposed to create a high-quality business park for new companies to move into the city or for the expansion of existing businesses. Council cabinet member for development Tahir Ali said: "I am delighted to see the historic Aston Tavern refurbished to such a high standard. "The Tavern was in a very poor state of repair and it has now been transformed to become a real asset to the area and the Advanced Manufacturing Hub. I wish Chelle Property every success with this venture." The HCA inherited the site from the now defunct regional development agency Advantage West Midlands. Stuart Buckley, development manager for HCA Midlands, added: "The transformation of the Tavern site has given us a great opportunity to provide a social venue which we hope will be a meeting hub for surrounding businesses." There was wide opposition when the demolition of the 1902-built landmark King Edward Pub was approved last year. The council has argued that the pub needed to go to allow the junction on Lichfield Road to be widened to take larger lorries serving the new industrial estate.